Next stop(s): Jamestown Settlement, Historic Jamestown, Yorktown Victory Center and Yorktown Battlefield. Yes, we were worn out by the end of day 2. The museum at Jamestown Settlement is fantastic. The exhibits are informative, interactive, interesting and innumerable. 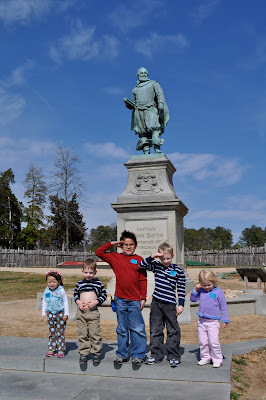 This was our first visit to Jamestown and we were truly impressed. But, you cannot take photos inside, so we didn't. Luckily, there were plenty of celluloid (i.e. flash technology) worthy moments to be had outside. The museum is to the left of where Isaac and Nancy are doing what Isaac and Nancy do best. 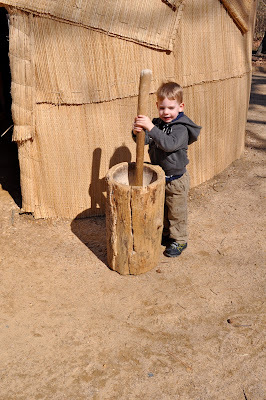 In the recreated Powhatan Indian village they instructed the kids to touch everything. This "Indian" demonstrated how to make a knife from chert. He then very helpfully gave my 3 year-old son a discarded shard to carry around. It took only seconds for us to discover that the Indians had very good reasons for making knives from chert. Needless to say, the souvenir shard was left behind. Another native provided a fire-making demonstration. If you look closely, you can see the tendrils of smoke rising up. Rubbing sticks together really does make fire. You know, just in case you were wondering. 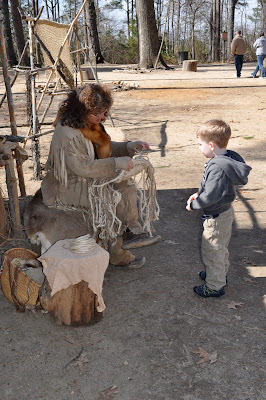 This Indian demonstrated basket weaving to a surprisingly enthralled Isaac. 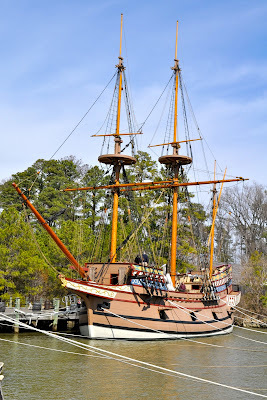 From the Indian village we headed to the wharf and boarded the Susan Constant, where more fun was had by all. 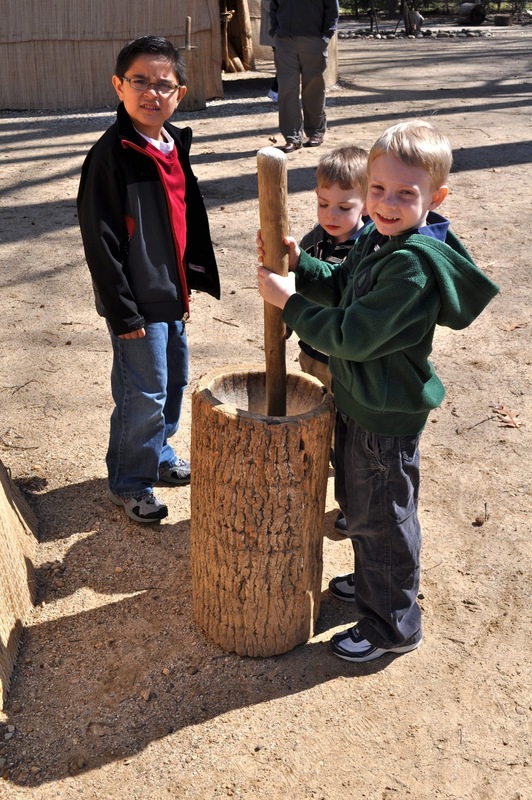 The boys manned the tiller, visited the captain's quarters, and played lookout on the prow. 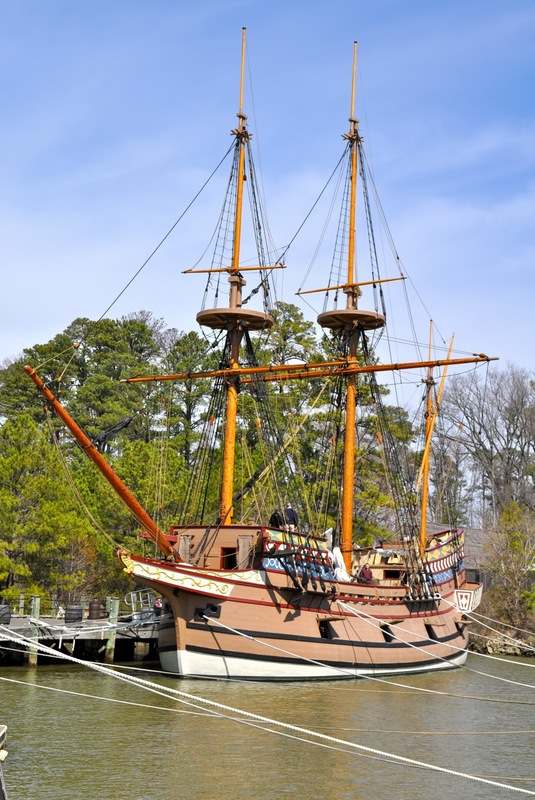 The Susan Constant in all her glory and splendor. Next up was a visit to the replica of the original Jamestown settlement. In addition to Nancy, we were joined by our friends Jimmy, Jessie and Josh. 5 adults, 6 kids and 4 historical sites = super fun! Isaac and Caleb looking very fierce in their 1607 appropriate attire. The musket shot demonstration. The kids loved this. Of course. Next up was a stop at the actual Jamestown settlement site. The boys posed in front of the church built in 1908 as a replica of the original church built in 1608. Last year, the foundation of the 1608 church was discovered. Our motley crew and the statue honoring Captain John Smith. After lunch we made our way to the Yorktown Victory Center. Again, we toured an extensive and interesting museum where photography was discouraged. Then we headed outdoors to visit the replica of General Washington's camp. We saws dozens of cannons so it seemed appropriate to capture at least one. Here the children learned about various techniques, tools and medicines used by army doctors in the late 18th century. Our friend Matt is a doctor and very grateful to be practicing medicine in the 21st century. The descriptions provided were pretty gruesome. On the way to the battlefield at Yorktown, we stopped for a few moments to learn about life on a farm in the 1780s. The kids really enjoyed their pretend meal. Finally we made it to the battlefield. Which is just that, a field. But, it is where General Cornwallis surrendered to General Washington, effectively ending the American Revolutionary War and forever earning a place of significance in American history. The younger kids and I skipped the audio tour -- they were done, and so was I -- but Caleb was thrilled to go along for the ride and learn about the soldiers and the fighting. Last stop and where we killed time waiting for our history buffs was the Yankee Candle flagship store. If you make it to Williamsburg and you happen to have some spare time, build in a visit to what can only be described as a shopping experience. It snows in Santa's village every 4 minutes and Santa is there all year long. You can make your own candles using an endless variety of scent and color combinations. And, since they sell every Yankee Candle product imaginable, the store smells heavenly. Day 2 was a long day, but it was fun and educational. Can't beat that! That was one full day! 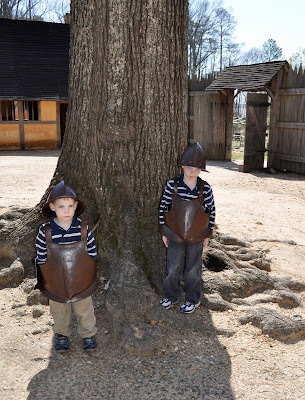 I have great memories of Jamestown as a kid then as an adult with my own kids. Glad you made it there.